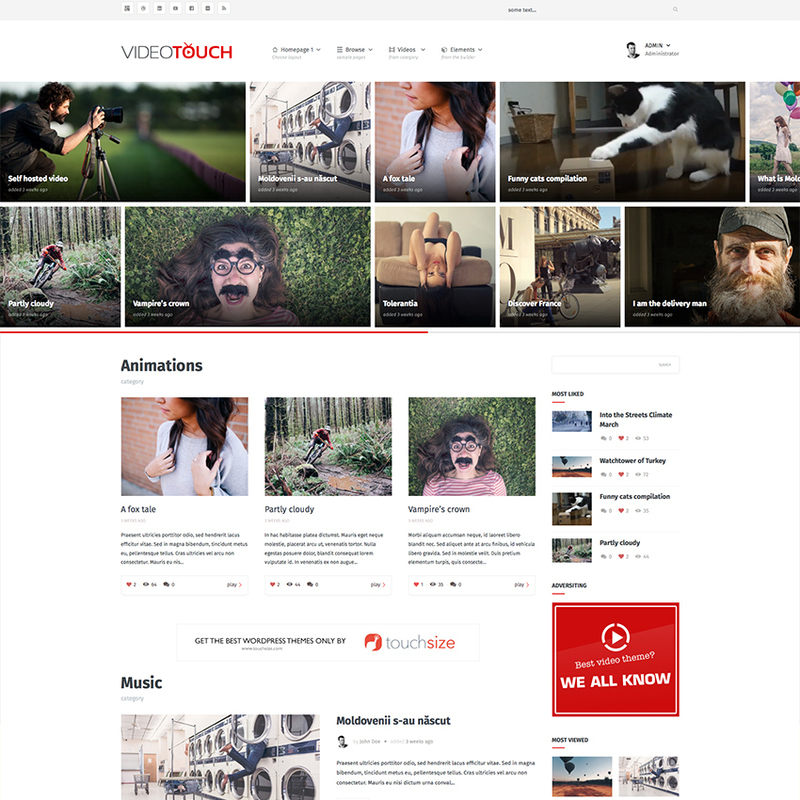 VideoTouch is a superfine and flexible Premium Video WordPress Theme built on Twitter Bootstrap framework. With a built-in like feature, and all the features you expect from a theme developing company like TouchSize such as search engine optimization, custom made mega menu, responsive and beautifuly crafted. It is perfect for creating a video blog, video review, podcast, video tutorial or just about any other video related site. It comes with plenty of tools and features including an advanced control panel, custom widgets, ad management, cross-browser compatibilitym custom page templates, front-end submission feature, beautiful sharing options and supports oEmbed from major video websites (YouTube, vimeo, dailymotion, metacafe, etc), it is retina ready and features a modern aesthetic, using principles of flat design. VideoTouch makes use of our excellent Touch Drag and Drop layout builder and which let’s you create unlimited layouts, making it easy to create your own color branded theme (unlimited color options), included demo data and a very powerful admin panel that makes it easy to maintain and change everything on the theme. In addition, this powerful layout builder includes heaps of elements that you can put together to suit your needs. It has brilliant meta options gives you the capability to control the layout of each page/post, setting sidebars, thumbnails, links, and more. Aside from its intuitive layout builder, this theme is packed with an easy to use custom theme options panel. VideoTouch comes with .po and .mo files which will make it easy to translate the theme to your language. Demo content is also bundled in the theme package to help you install and tweak this video theme with ease. The theme is also secure and has WooCommerce integration available which let’s you sell products over the web with ease. The front-end submission feature is simple and beautifully crafted, lets users register and add their own videos using 3 options – oEmbed, Embed code or uploading their own MP4 video. It is also easy to monetize using VideoTouch since it offers pre-roll ads (showing ads before serving the video to users), comes with 2 other advertising sections just below the header and above the user comments. Other features included in this theme are: Full Google web fonts library, 500+ font face icons, WPML plugin ready not to mention the fantastic technical support to the customers.